Stop The Green Slime Returning. Is your pond full of green slimy blanket weed? 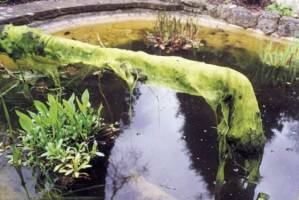 Have you tried removing the blanketweed from your pond by hand, but this unsightly green algae slime just keeps growing back? Have you tried using chemicals to kill the blanket weed in your pond, but it didn't kill the blanketweed, instead it killed your plants? Are you looking for a way to kill the blanket weed growing in your pond, and to stop the algae growing back? Look no further, we can kill the existing blanketweed growing in your pond, and we can stop green algae growing back. Blanket weed is one of the greatest problems facing pond keepers today. 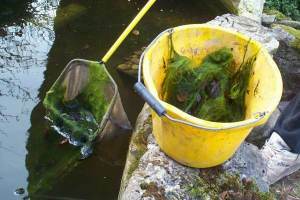 Most UK pond keepers will struggle to stop green algae growing in their ponds. Many will give up their ponds because of their failure to defend their pond against green algae slime. At Tadpole Technologies Aquatics UK we have simple, effective solutions. We can help help you to kill the blanketweed growing in your pond, and stop it from growing back. Let us help to take some of the worries out of pond keeping and allow you to relax and enjoy your pond, with peace of mind. Effective Control of Blanketweed. Is blanket weed strangling your pond? Blanketweed misery can now be a thing of the past. Banish blanket weed from your pond with these effective remedies from Tadpole. Phos-kit is a powerful weapon in the war against this ugly green invader. Phos-Kit - Mild remedy for regular dosing. Blanketweed, once it has started growing in your pond will continue growing at an almost epidemic rate. This unsightly green slime can take over the pond, tangling itself around the plants, choking the fish, covering streams and waterfalls and clogging up pumps. You can see it growing on the sides of the pond or growing unattached in mid-water. Blanket weed is a filamentous algae, a very simple, primitive plant. Biologically it is very similar to the algae which turn the colour of the water green. Green water algae is single celled and free floating. Blanketweed algae cells are growing in long chains giving it its thick hairy appearance. Blanket weed can be removed by hand but this is slow, laborious and will not stop it growing. Much of the blanketweed cannot be removed in this way and it will quickly start growing again. The only really effective way to stop blanket weed is by the use of medication. An effective pond treatment will kill the blanketweed and stop it from returning. There is a bewildering choice of treatments available to kill blanket weed. We are offering only one brand of blanketweed control treatments to kill it and to stop it re growing. Working closely with landscapers specialising in the care and maintenance of ponds and water gardens, we have thoroughly tested many different brands of algaecide in a wide range of situations and have carefully assessed how well they kill the blanket weed and stop it re growing. Phos-kit is easily the most effective treatment available to kill blanketweed and to stop it re growing, that we have tested. This is a mild treatment and is suitable for regular dosing. Phos-Kit actually promotes the growth of plants in the pond. Phos-Kit will attack the existing blanket weed and will stop re-infestation of the pond. Blanket weed will only be growing in the pond if the water conditions are suitable. 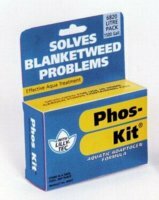 Scientifically formulated, Phos-kit will kill the blanketweed indirectly by changing the chemistry of the water. Once treated, the water conditions are no longer suitable for blanket weed to continue growing and it will stop growing and die. Continued treatment of the pond ensures that the water chemistry remains unfavourable to blanketweed and will prevent its re-growth. The pond should be treated regularly with Phos-Kit at 14 day intervals, until all the blanket weed in the pond has disappeared. After this, the dosage can be reduced to monthly intervals. As with all algaecides it is important that the pond water is not being replaced or significantly diluted. If your pond is leaking badly and losing more than 4 inches of water in a week, or if you have a natural stream feeding into the pond and diluting the water, the algaecide will not kill the blanketweed. Any chemicals will be washed away. This will prevent them working as there will not be enough chemicals left in the pond to kill the blanket weed. However, If the water supplying your stream is recycled using a pump this will not affect the successful use of Phos-kit. Tadpole Tip: As the blanketweed dies, it decomposes. This is a normal natural process that is caused by the action of bacteria and happens to all organic life once it has died. The bacteria that consume the dead blanket weed, use a lot of oxygen. There are some simple steps you can take to prevent the oxygen levels in the pond falling too low: Remove as much of the blanketweed as you can by hand before dosing with medication. This reduces the amount of weed that will die and decay once the pond has been treated. Another way is to provide some additional oxygenation to the pond until the blanket weed has disappeared. Oxygen can be added to the pond by using a fountain or using an air-stone connected to an air pump. Low oxygen is not an effect of the medication, Phos-kit does not have any direct effect on the oxygen levels in the pond. It is caused by the natural processes of decay as the blanketweed dies and rots away. It is important to know how much water your pond contains. Each packet of Phos-Kit contains enough medication to treat 6820 litres (1500 gallons) of pond water. When using chemical treatments in the pond, always follow the instructions contained in the box carefully.